You will have the best shopping experience in Palestine, with more than 80 international brands in fashion, sports, children and many more, all available for both genders. The technology center in Rawabi seeks to attract local and international IT companies, and to promote this sector by providing thousands of job opportunities and competitive infrastructure capable of providing a strong starting point for this sector in Palestine. Rawabi Q Center offers many of the most state-of-the-art offices to accommodate many local, international and emerging companies. It provides an ideal environment for business development and benefits from friction with companies with long experience and achievement that creates thousands of jobs. The commercial center of Rawabi-Q-Center reflects the style of the old Palestinian markets with modern touches, equipped with modern technology. QUEEN CENTER The city of Rawabi, the newest and largest shopping mall in Palestine, offers the perfect shopping and family atmosphere with its unlimited shopping options. The mall has a variety of indoor and outdoor amusement parks including fun games for children and adults. The commercial center of the city of Rawabi-Kiosk has a wide and secure car park to ensure the comfort of the visitors. 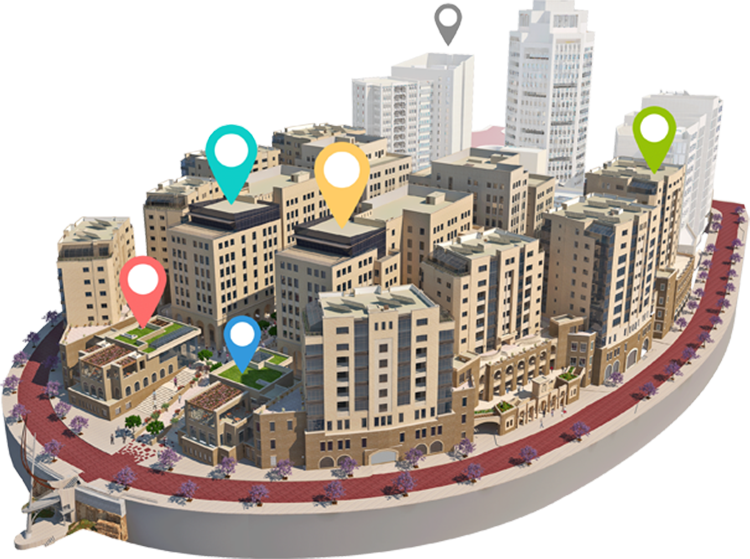 It provides the first integrated technology complex in Palestine, equipped with a world-class and many banks. It also includes luxury residential units and offices for companies seeking a supportive environment for the world. A business that will enrich business experiences.